A Sharm El Sheikh marine biologist slammed the conspiracy theory circulating around the country that last week's shark attacks off the South Sinai resort of Sharm El-Sheikh were part of an Israeli conspiracy, but the South Sinai governor supports it. Mahmoud Hanafy, a professor of marine biology at the Suez Canal University, told Ahram Online that it is "sad," that Egyptian national TV helped propogate the theory that the shark attacks, which resulted in one death and four serious injuries this week, may have been controlled by Israel. Speaking on the public TV program "Egypt Today" yesterday, a specialist introduced as "Captain Mustafa Ismail, a famous diver in Sharm El Sheikh," said that the sharks involved in the attack are ocean sharks and do not live in Egypt's waters. When asked by the anchor how the shark entered Sharm El Sheikh waters, he burst out, "no, it's who let them in?" Urged to elaborate, Ismail said that he recently got a call from an Israeli diver in Eilat telling him that they captured a small shark with a GPS planted in its back, implying that the sharks were monitored to attack in Egypt's waters only. "Why would these sharks travel 4000 km and not have any accidents until they entered Sinai waters?" asked Ismail. Earlier today, General Abdel-Fadeel Shosha, the governor of South Sinai, backed Ismail's theory. In a phone call to the TV program, he said that it is possible that Israeli intelligence, Mossad, is behind the incidents and that they are doing it to undermine the Egyptian tourism industry. He added that Egypt needs time to investigate the theory. 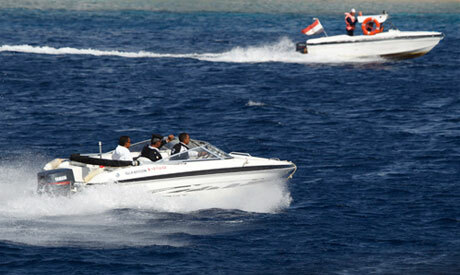 Marine biologist Hanafy refuted the allegations, saying that the Oceanic White Tip, blamed for the attacks, does indeed exist in Egypt's waters. He also added that the existence of a GPS inside the shark does not mean there is a conspiracy at play, adding that these "tracking devices" are often used by marine biologists to study sea life. "Here in Egypt we put these devices on turtles, in danger of becoming extinct, so that we can watch their behavior, see where they live, feed and lay their eggs," explains Hanafy. "It sends signals to the satellite every time the creature appears on the surface of the ocean. It is sad that they made a person whose only knowledge of sharks comes from the movie Jaws go on national TV to propagate this mumbo-jumbo." This morning, a team of Egyptian and foreign divers and photographers started surveying the popular diving spots of Sharm El-Sheikh, the Ras Mohamed Protectorate, and Tiran. According to General Shosha, the surveillance will be conducted for 72 hours in diving areas and 24 hours in swimming and snorkeling areas. Shosha added that shark experts from Australia and the US were expected to arrive soon. He also added that several beaches are temporarily closed and tourists are currently redirected to alternative beaches in the Ras Mohamed Protectorate, and for the first time the Nabq Protectorate has been opened to accommodate tourists. Earlier today, Hisham Gabr of the Chamber of Diving and Water Sports said that Sharm El-Sheikh will be open for diving tomorrow, but only for divers with at least 50 logged dives. This has to be the most hilarious charge yet lodged against Nation Israel! One would have to be very gullible to believe anything from the Arab world as true; this just tops it all! As rediculous as it appears to blame Israel over these attacks, some good may yet become of this as the locals overcome the hysteria of the attacks and put an end to what draws the sharks to areas frequented by man, i.e. dumping of food into the water and feeding sharks for the entertainment of divers. The only intelligent response to the problem I have heard so far is the limitation of divers to only those with 50 logged dives. Those divers are less likely to panic when they see a shark and act like a sharks normal prey. And that is to have sharks with frickin' laser beams attached to their heads! No way this is a serious article, right? Next time I want robot sharks with frikkin lasers on their heads!! I think these people saw the Austin Powers movies too many times. In it Professor Evil whined about getting a shark with a "laser". Maybe that is the next step? Whenever we in the West read stories like this, it further reinfores how backwards and, frankly, retarded, much or most of the Arab world really is. Where are all the other right-thinking Egyptians like Proffesor Mahmoud Hanafy? They need to speak out publicly - all the time - and try to pull their culture out of the Middle Ages. It would be funny if these attitudes weren't so deadly. After all, it's small and simple minds like these that fuel the eternal war against Israel. This is part of the reason why the world laughs at some politicians, particularly those in the Middle East. Just how does he think a GPS would cause the shark to attack? Even if the shark had 10 GPS monitors on it that wouldn't make it swim into Egyptian waters and attack. If you are going to make things up at least try to make them believable.